“Greening” products by achieving more efficient use of energy and material inputs is important but evidence suggests that greater efficiency alone will not be sufficient to significantly lessen the resource impacts of our collective consumption. Simplistic assumptions that capitalism’s propensity for efficiency will allow us to stabilize the climate or protect against resource scarcity are nothing short of delusional. 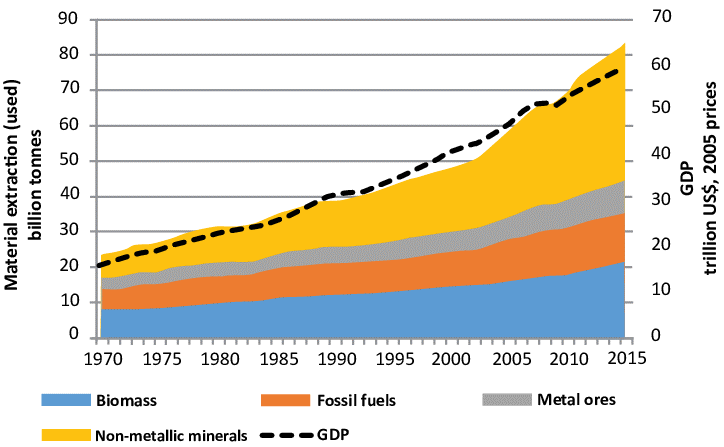 Despite gains in material efficiency, the global use of materials, and the accompanying impacts of extraction, processing and disposal, continues to increase. The United Nations Environmental Programme (UNEP) reports that “while long-run relative decoupling of material extraction from GDP can be observed at a global level, this relative decoupling is not sufficient to prevent a persistent increasing trend in absolute resource extraction. Indeed, in contrast to the long-run relative decoupling trend over the 20th century, recent years’ data suggest that resource extraction has begun to increase at a faster rate than GDP, suggestive of 'recoupling'." So why are technological improvements falling short? First, gains in efficiency are often used to fuel growth in production. So instead of reaping the benefits of greater efficiency, production levels have continued to grow and environmental impacts along with them. Reversing this trend requires very large improvements and it’s very unlikely that technology (alone) can produce the needed reductions in impact. Secondly, rebound effects cut into efficiency gains and may dampen or diminish any improvements. The rebound effect occurs when a consumer engages in a behavioral change that saves them money; the savings are then spent in other ways, with resulting environmental and economic impacts. Finally, the benefits resulting from technological improvements can be overwhelmed by the scale of overall consumption. So while some products and services become greener, the sheer volume of global consumption outpaces any upstream improvements.